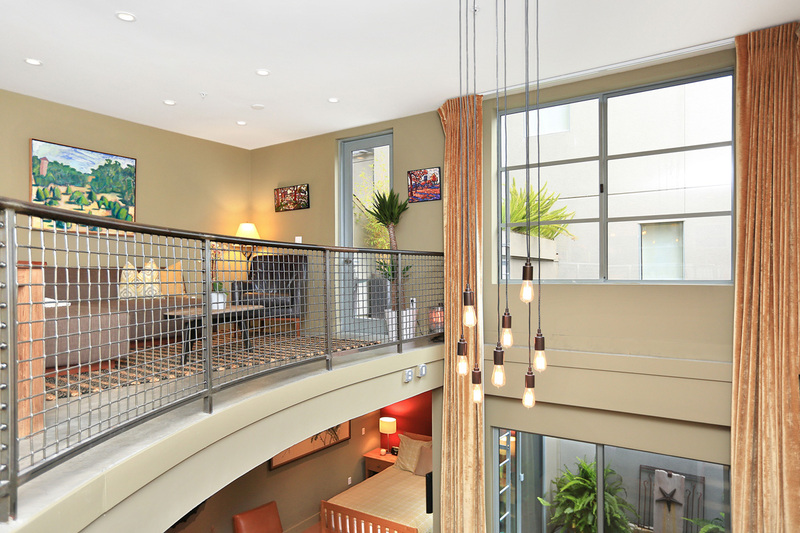 Superbly designed two-level SOMA loft with an architecturally distinguished upper loft profile, gallery-style wallspace, and nicely finished details. A loft with the feel of a condo. Rarely seen reverse floor plan with living area upstairs and sleeping/office area down, with a private patio for each level! Located on the sublimely quieter offstreet side of the building on one of SOMA’s cherished side-streets. Features dual-zone radiant heating, in-unit laundry, and deeded garage parking with extra space. 96/100/97 walk/transit/bike Walkscores. UPPER: Living/dining room, gas & stainless kitchen w/ granite breakfast bar, concrete floors, half bath, laundry in closet, and access to upper private outdoor patio. LOWER: Spacious bedroom, open sitting/office area, beautifully remodeled bath, luxurious carpeting, generous organized closets, and access to the second private outdoor patio.